Tropic Days Backpackers i Cairns, Australien : Boka nu! 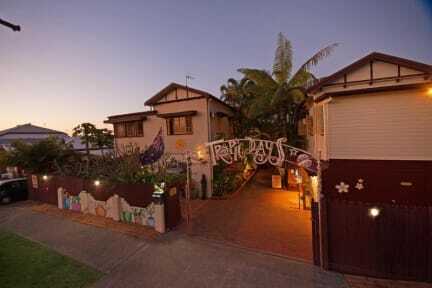 Best hostel in Cairns! Met a lot of great people and the atmosphere is so good. Expect to stay longer than planned. 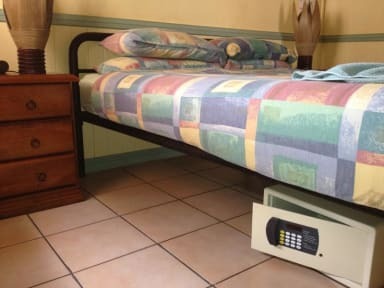 But be aware of the neighbors, cause the hostel is located in a residential area! A bit far from town but the shuttle will take you there often enough, so no long walks are required (except at night). I definitely coming back sooner or later. You can tell these owners really care about their place and every guests stay. Proper clean every day, great kitchen utencils, lovely atmosphere. The place is perfect for meeting other travellers as it is not to big and designed so that everybody meets by the benches in the middle. The location outside town was perfect for us as well. Really cosy hostel, the staff is wonderful! An amazing hostel! The atmosphere, the staff and the facilities make you feel at home from the first second. We really did not mind the location being a bit outside of thw cbd, it justs adds to the "homey" feeling. And if one does mind, there are free shuttle busses from the hostel into town throughout the day. Will reccomend everyone to stay here! Snäll och hjälpsam personal. Gratis buss till piren/båtar och även till greyhound hållplatsen några gånger om dagen. Det går att promenera till staden på mindre än 30 minuter. Bra information om olika ställen att åka till. Gratis te och kaffe och om man har tur även gratis bröd till frukost. Cosy hostel with great atmosphere! Not a party hostel. The girl in the reception is really friendly and helped to book a lot of tours. You have to pay 1 dollar for 3 hrs air con. There are safety boxes. Bread included for breakfast. Shuttle bus to town, last bus is 9 pm. Takes 20-30 min to walk. Subway is nearby. Swimming pool.